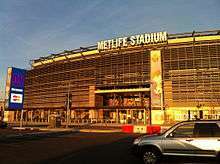 This article is about the stadium in Jersey City. For the stadium in Union City, see Roosevelt Stadium (Union City). Left Center – 377 ft. Right Center – 377 ft.
Roosevelt Stadium was a baseball park at Droyer's Point in Jersey City, New Jersey. It opened in April 1937 and hosted high-minor league baseball, 15 major league baseball games, plus championship boxing matches, top-name musical acts, an annual championship drum and bugle corps competition known as "The Dream", important regional high school football and even soccer matches. It was demolished in 1985. On June 5, 1929, Jersey City Mayor Frank Hague announced his plans to construct a 50,000-seat municipal stadium in Jersey City to surround a field 500 feet long by 400 feet wide, that would be dedicated to the memory of the city's war dead. It was expected to cost $500,000 and be built by Spring 1930. Mayor Hague planned for the stadium to have 35,000 permanent seats with ground space for an additional 15,000. It would be a multi-purpose stadium for baseball, football, track and field events, and boxing. Roosevelt Stadium was finally built in 1937, as a Works Progress Administration project on the grounds of what was the Jersey City Airport at Droyer's Point. The airport was operated by Eddie August Schneider starting in 1935. It was named for President Franklin D. Roosevelt, the author of that New Deal agency. It was designed in Art Deco style. The ballpark's opening was scheduled for April 22, 1937 with the opening of the 1937 International League season. Mayor Hague declared a half-holiday for the city's schools and employees. New York Giants owner Horace Stoneham was expected at the opener along with Senator Harry Moore. Rain washed out the planned events and the opening was moved back to April 23 with Mayor Hague throwing out the first pitch and Sen. Moore and owner Horace Stoneham on hand for the ballpark's dedication. Initially constructed as a home field for Jersey City's International League affiliate of the New York Giants, the stadium later saw its most common use for high school football, as Jersey City's William L. Dickinson, James J. Ferris, Abraham Lincoln, Henry Snyder high schools and the city's major parochial schools, Hudson Catholic and St. Peter's Prep, all used the stadium, particularly on Thanksgiving Day, when Dickinson and St. Peter's would sell it out. It was the site, in September 1974, of the game that set the New Jersey state record for consecutive losses by a high school football team at 42, when Dickinson High School lost to Hudson Catholic, 22-0. The Hawks offense was led by quarterback Steven Neri and halfback Tony Cavallo and Dickinson was held to -2 yards rushing and 18 passing by a Hudson defense led by Steve Cuccinelli, Ray Parente and Bruce Bock. Neri, Bock, Parente and Cuccinelli have all been inducted into the Hudson Catholic Football program's Wall of Fame. Jersey City State College (now New Jersey City University) played their home football games on Friday nights at Roosevelt stadium during the 1970s. It was used for 15 "home" games by the Brooklyn Dodgers during their last two seasons in Brooklyn – seven in 1956 and eight in 1957. The games were played partly as a negotiating tactic with the Borough of Brooklyn, in pursuit of a new stadium to replace Ebbets Field. While it had just 24,000 seats as opposed to Ebbets Field's 31,497, Roosevelt Stadium had 10,000 parking spaces compared to Ebbets Field's 700. 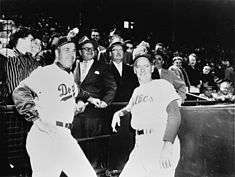 The Dodgers' negotiation came to naught, and the team moved to Los Angeles in 1958. It was also the home field of the Jersey City Giants, a farm team of the New York Giants in the Triple-A International League from 1937 to 1950, the Jersey City Jerseys of the IL in 1960 and 1961, the Jersey City Indians of the Double-A Eastern League in 1977 and, following a change in minor-league affiliation, the Jersey City A's of the EL in 1978. On April 18, 1946, Roosevelt Stadium hosted the Jersey City Giants' season opener against the Montreal Royals, marking the professional debut of the Royals' Jackie Robinson. In his five trips to the plate, Robinson made four hits, including a three-run homer, scored four runs and drove in three; he also stole two bases in the Royals' 14-1 victory. The Giants finished first in the IL in 1939 and 1947, but no Jersey City team ever went on to win a pennant in postseason play. Hague routinely hawked opening day tickets for "Little Giants" games, selling 40,000 seats in a stadium that held only 24,000. When asked about the discrepancy, he was reported to have said "Hell of a crowd in the men's rooms." In 1940, former heavyweight champion Max Baer beat "Two Ton Tony" Galento at Roosevelt Stadium. In 1948 Marcel Cerdan defeated Tony Zale in a middleweight championship title fight. In 1950, Sugar Ray Robinson defended his welterweight title. Drum & Bugle Corps perform at Roosevelt Stadium, 1972. In 1971, the stadium was selected to host an NASL and international soccer double-header. Bologna were to meet West Ham United while the New York Cosmos were to play the Dallas Tornado in the opener. A week later, Santos (Brazil) were scheduled to meet Bologna with Pelé announced. The first doubleheader was set for Yankee Stadium in NY but the contract that the Cosmos had with the Yankees allowed for a "weather clause" in which the baseball team could cancel if bad weather conditions posed a potential threat to the field. The stadium saw sporadic use as a music venue during its final years of existence. Most notably, the Grateful Dead employed the space as their principal Metropolitan New York venue in the mid-1970s after the demise of the Fillmore East and ensuing flirtations with comparable smaller venues, ultimately performing at the stadium six times between 1972 and 1976. Yes, The Allman Brothers Band, James Brown, The Band, The Beach Boys, The Eagles, Eric Clapton, Pink Floyd, Tony Bennett, Crosby, Stills, Nash & Young, Emerson, Lake & Palmer, and Alice Cooper also performed at the stadium. A very young Lynyrd Skynyrd played a blazing show in August 1975 while opening for Rod Stewart/Ten Years After. KISS played their very 1st "Stadium" show here on July 10, 1976, with openers The J. Geils Band and Point Blank; the show was documented and released on DVD as "The Lost Concert". Each summer from 1949 through 1980 the stadium was host to one of the most prestigious drum and bugle corps championships, The National Dream. During that span, over 100 of the country's most elite competitive drum and bugle corps met to battle it out on the stadium's sun-baked field vying be crowned Dream Champion. 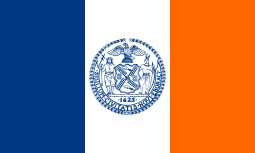 Famed corps such as Jersey City's own St. Patrick's Cadets, Newark's St Joseph's Cadets "The Hilltoppers",Blessed Sacrament Golden Knights and St. Lucy's Cadets, Bayonne's St. Andrew's Bridgemen, the Garfield Cadets, Blue Rock, and many more from around the nation met in Jersey City each summer. The original host corps was the St. Vincent's Cadets from Bayonne N.J. Many Senior corps were involved as well. The famous Hawthorne Caballeros. New York Skyliners, Reilly Raiders, Archer Epler, Muskateers and Lt. Norman Prince just to name a few. In November 1982, the Jersey City City Council voted to demolish the stadium. It was finally demolished in 1985, and a gated community named Droyer's Point opened on the site in 1987. 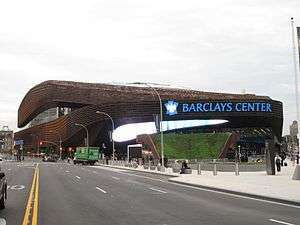 ↑ "Jersey City Plans Stadium to Seat 50,000 As $500,000 Memorial to Her Soldier Dead.". New York Times. 1929-06-06. p. 21. 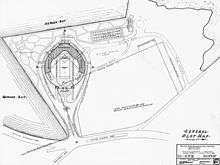 ↑ "Jersey City to Get WPA Stadium Fund. Mayor Hague Reports Application for $800,000 Approved for Arena at Airport.". New York Times. September 26, 1935. Retrieved 2007-08-21. 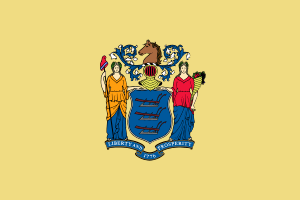 Mayor Frank Hague of Jersey City announced yesterday he had been informed that the Works Progress Administration had approved the city's application for an $800,000 grant to build a municipal sports stadium. ↑ "Two In Plane Escape In Newark Bay Crash. Schneider, Ex-Transcontinental Record-Holder, And Student Pilot Rescued By Police.". New York Times. May 16, 1935. Retrieved 2007-08-21. Two aviators escaped with only minor bruises and a thorough wetting last night when their three-seat, open-cockpit biplane developed motor trouble soon after taking off from the Jersey City Airport and fell into Newark Bay 200 feet off Droyer's Point, Jersey City. The men were rescued by police, who went to their aid in a collapsible rowboat kept at the field. ... The plane [had] taken off at 7 pm [piloted] by Edward Schneider, 23 years old, of 209 Sip Avenue, Jersey City, former holder of the junior transcontinental plane record and manager of the airport since January 1, 1935. ↑ Kingsley Childs (1937-04-22). "International League to Begin Fifty-Fourth Season Today; JERSEY CITY READY FOR GALA OPENING". New York Times. ↑ Arthur J. Daly (1937-04-23). "JERSEY CITY EAGER TO SEE NEW CLUB; Opener, Put Back Because of Rain, Is Expected to Draw 30,000 Fans Today". New York Times. p. 26. ↑ "Dodgers Ballparks". MLB.com. Retrieved 2011-09-03. ↑ "Doby Hits 500 Foot Homer for Griffith Stadium Record". The Milwaukee Journal. May 26, 1949. Retrieved 2011-07-24. ↑ Stout, Glenn; Johnson, Richard A. (2004). The Dodgers: 120 years of Dodgers baseball. Houghton Mifflin Harcourt. p. 206. ISBN 0-618-21355-4. ↑ Joseph Malinconico (1982-11-28). "ROOSEVELT STADIUM: GLORY FADING FAST". New York Times. Wikimedia Commons has media related to Roosevelt Stadium.